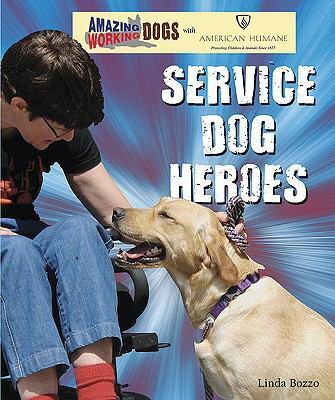 SERVICE DOG HEROES is one of six books in the AMAZING WORKING DOGS series by Enslow. The book begins by introducing us to Kazi, a service dog for Jacqueline, a woman whose "disabilities involve the muscles in her body and make it painful for her to move." The reader follows Kazi as she helps Jacqueline throughout her day- bringing her clothes, turning on lights, getting pans, opening cupboards, going to work, and playing at a dog park. Other chapters describe the history of service dogs, talk about different breeds' suitability for this work, explain how the dogs are trained (my favorite photo is a golden retriever puppy learning to open a cupboard! ), and tell what they do when they are retired. End tools include a glossary, books and websites for learning more, and an index. This is a really utilitarian little book, but I think it's one kids are going to love. I suspect the series, which also includes FIRE DOG HEROES, POLICE DOG HEROES, SEARCH AND RESCUE DOG HEROES, GUIDE DOG HEROES AND THERAPY DOG HEROES, is one that you couldn't keep on the shelves in an elementary library. 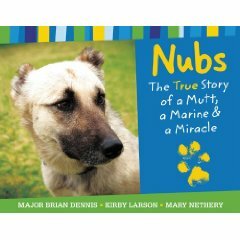 NUBS: THE TRUE STORY OF A MUTT, A MARINE, AND A MIRACLE by Major Brian Dennis, Kirby Larson, and Mary Nethery, falls into the category of books that have been around for a little while (this one was published in November, 2009) that everyone else has read and reviewed, but I hadn't and I loved it, so I'm going to review it anyway. Nubs is a German Shepherd-ish looking mutt, the leader of a wild dog pack struggling to survive in the Iraqi desert. In October, 2007, Nubs runs into Major Brian Dennis, a member of the Border Transition Team. Dennis shares his dinner (spaghetti, red beans and rice, and strawberry pop tarts) and the two become friends. Each time Dennis' Humvee returns to the area, Nubs is there waiting for him. When Dennis' troop is transferred, Nubs "treks mile after treacherous mile across the desert, shivering through frozen days and nights, with little to eat and even less to drink" to be with his special friend (ok, I gotta admit, this part made me tear up a little). "Two snowy days and seventy miles later," Nubs find his friend again. Unfortunately, soldiers in Iraq are not allowed to have pets, so Major Dennis and his company raise $2000 to send Nubs stateside. A great story, told in photos, text, and email remarks from Major Dennis!